National Geographic Adventure Magazine is your ticket to a life of excitement and great adventures. Through the talents of famed National Geographic writers and photographers you'll circle the globe; climbing, sailing, hiking, rafting, experiencing the greatest adventures of our time. Each issue of National Geographic Adventure Magazine is filled with first-class journalism and stunning photography and reaches a bold, new level, redefining the spirit of exploration for a new generation of adventurers. 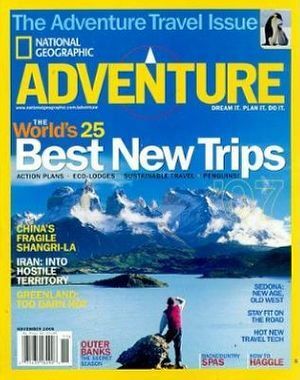 National Geographic Adventure Magazine is passionate, courageous, fun, and fresh - a smart take on the classic magazine that inspired it! We currently do not offer NATIONAL GEOGRAPHIC ADVENTURE MAGAZINE SUBSCRIPTIONS.